I’ve tried several different methods of germinating seeds for my hydroponic gardens. My preferred method is using rapid rooter plugs made by General Hydroponics. 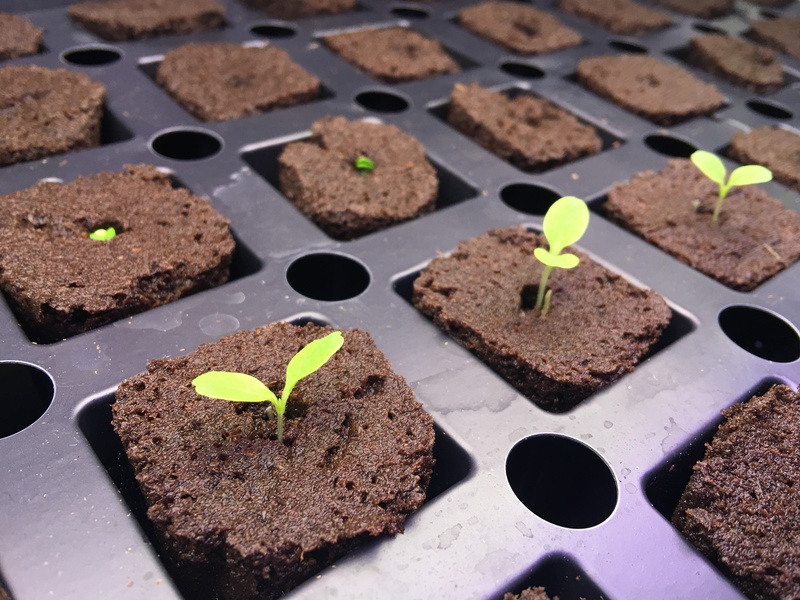 They are easy to use, have a great germination success rate and can be used in all of my different types of hydroponic systems. What Are Rapid Rooter Plugs Made Of? Rapid Rooter cubes are derived from composted materials. I’ve bought some derived from peat moss and some from tree bark. The plugs are formed in a way that creates optimal water to air ratio which promotes excellent root growth. I’ve found rapid rooter start plugs way easier to use compared to other seed starting methods like using rockwool. The first thing to do is soak the Rapid Rooter plugs in distilled water. Some people soak them up to 24 hours; I typically soak them for only a few hours and have had no issues. After soaking, place the plugs into the grow tray. Place a few seeds in the center hole of each plug. Using more than 1 seed increases the chances of successful germination for each plug. Tip* Tear a little piece off the bottom of the rapid rooter plug and place is over the hold where you placed your seeds. This will keep the seed completely dark, which is necessary for germination. Since some seeds may germinate before others, they will be able to push off the pieces of the cube as the seedling emerges, exposing itself to light. Other seeds that are still in the process of germinating will still be dark. Next, fill the tray with about a quarter-inch of water. There are holes at the bottom of where the plugs go, allowing to wick up water so they stay moist. Cover the tray with a dome to keep in moisture and warmth. If you don’t have a dome, you can cover the tray with saran wrap. Place the grow tray under a low-intensity light for seedlings and keep Rapid Rooter plugs moist by adding water to the tray as needed. Tip* Seeds have a better germination rate when provided some extra heat. If you need to warm up your rapid rooter plugs, place a seedling heat mat underneath the tray to maintain a warmer temperature. As seedlings grow they can be put under more intense light. Plants will form a more a larger root system and eventually be ready to be transplanted into your hydroponics system. 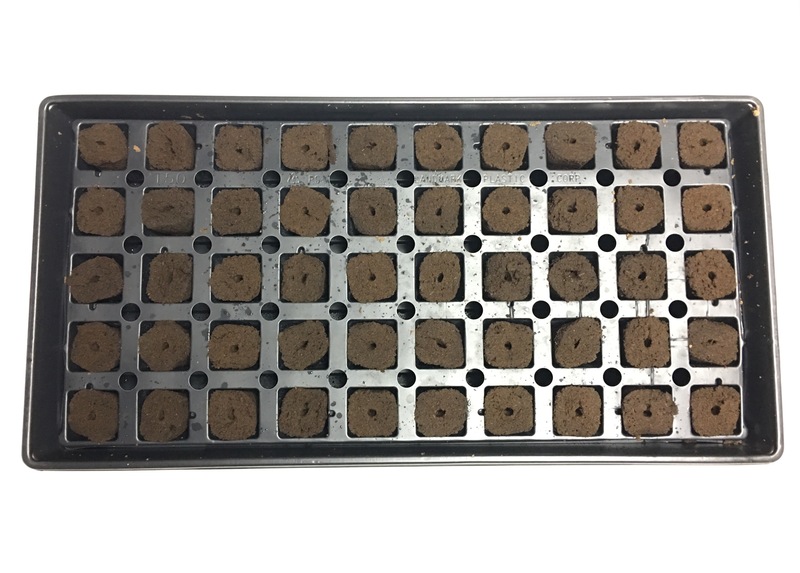 Rapid rooter plugs are very versatile and can be transplanted in any grow medium, even including dirt. Using rapid rooter starter plugs is my preferred method when I start seeds for my hydroponic garden. Using these starter plugs just makes the process so much easier compared to other methods. The tray keeps the plugs moist so there’s not much work involved. Plugs promote a healthy root system in seedlings to start your garden off on the right foot and replacement plugs are affordable. Do the seeds in the rapid rooter get light right away? 24 hours like veg stage? Thanks for the question! I would recommend waiting for the seeds to sprout above the top of the rapid rooter before placing them under light. DO you need to seal the hole above the seed or is it okay to leave it open? Good question. Covering the hole may be necessary if you can not germinate seeds in dark place. It’s especially helpful when germinating tricky seeds where some may sprout before others. That way you can have the light on for those that are sprouting while still allowing the other seeds time to sprout. Covering hole is fine from seed. Don’t push torn piece of cube into hole in cube where seed is. Just take large enough piece to cover hole to stop light and remove to check germination. hi, can I use rapid rooter to germinate my seeds, then transplant into potting soil for? Absolutely, plants germinated in rapid rooter can be transplanted into dirt. Do you have to wait for the seed to start sprouting before putting in rapid rooter? It’s not necessary to start the seeds before placing them in the plug. Will the seedling drown if tap root grows down into the water? Rapid rooter plugs provide a good air to water ratio for the plant’s root system, so the seedling won’t drown if the tap root goes down into the water. So if i put about a quarter inch of water in the tray to wick up into the rapid rooter it wont get to soggy? And drown the seedling? At what point should i remove the water? Or should i keep water in the tray until ready tp transplant? You’re correct on the amount of water to add and it won’t get too soggy. The rapid rooter plugs will wick up water from the bottom and need to stay moist until seedlings are ready for transplanting.